"I needed a nourishing and complete meal-in-one that I could take with me on the go. I prepare this the day before I travel and put it in the fridge overnight. It has a great flavor that, when left to sit at room temperature, bursts through even more. The spinach leaves are sturdy and resilient so don't wilt as would lettuce. I hope you like it." Place lentils into a bowl and cover with several inches of cool water; let stand at least 2 hours. Drain and rinse. Mix olive oil, paprika, pepper, turmeric, red pepper flakes, mace, coriander, and rose petals together in a bowl. Combine lentils and 4 1/4 cups water in a pot and bring to a boil; cook until lentils are tender yet firm to the bite, 15 to 18 minutes. Add buckwheat groats and return water to a boil; add salt. Cook lentils and buckwheat for 10 minutes; remove from heat, cover pot, and let sit until all water is absorbed, about 5 minutes. 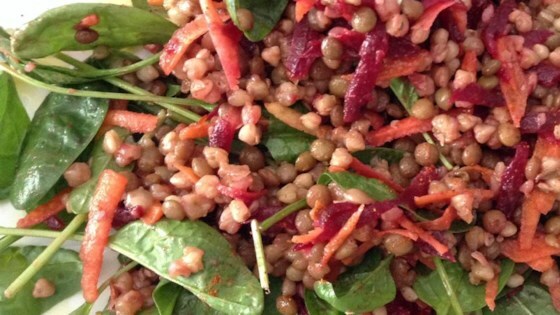 Pour lentils and buckwheat into a large bowl; add spinach, beets, carrots, and green onions. Pour seasoned oil mixture over lentil mixture and stir to coat. Drizzle apple cider vinegar over salad and stir to coat. Refrigerate for flavors to blend, at least 30 minutes. The flavors in this were very satisfying. I didn't have the buckwheat so I substituted bulgar wheat and just reduced the water.